To be sustainable, cities should be designed according to the circular principles of nature, including making maximum use of solar radiation and treating waste as a resource. Newly designed facilities are pioneering these principles, including Park 20|20 in the Netherlands and NASA’s Sustainability Base in California. “Positive cities” allow people to live and work in the same neighborhoods, creating great efficiencies and promoting safe, dignified and creative lives. Cities are home to more than half the world’s population, and they exert increasing stress on the earth. They produce up to 70 percent of global carbon dioxide emissions, use up vast quantities of water, degrade water quality and produce mountains of waste. As cities go, so goes the planet. And cities are growing—fast. By 2030, according to the latest United Nations estimates, five billion people will live in cities, nearly half of them conducting their lives in homes, schools, workplaces and parks that do not yet exist. 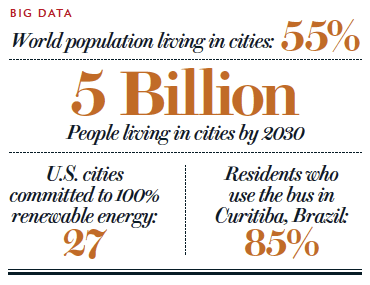 The challenges in making cities as sustainable as possible are enormous. But they are also inspiring because cities can play an outsized role in creating solutions for a more sustainable world. Cities are engines of innovation and entrepreneurial energy. As networks of city leaders are showing, municipalities are also powerful actors, pooling their strengths, setting environmental agendas and exercising global leadership. From megacities to towns, mayors and city councils, investors, economists and planners are responding to the urgent need to redesign the basic elements of fast-growing cities from the ground up. How they reimagine the urban landscape and how they design growth will profoundly influence the future of all life on earth. Many cities are taking important steps to reduce air and water pollution. They are being “less bad.” Efficiency in itself, however, is insufficient to move us to a positive future. If cities can also be effective and do “more good,” for example, by converting waste back into nutrients for food production, cities can propel us toward a future we want, not just reduce the impacts we do not want. More good, not just less bad. A clear vision for reimagining the city and its relationship to its surrounding countryside can be found in replicating the operating system of the natural world. In essence, natural systems operate on the free energy of the sun, which interacts with the geochemistry of the earth to sustain productive, regenerative biological systems. Human systems, including cities, that operate by the same laws can approach the effectiveness of living systems. These laws can be distilled into three key principles: equate waste with food; maximize use of solar income; and celebrate diversity. Waste does not exist in nature, because each organism contributes to the health of the whole. A fruit tree’s blossoms fall to the ground and decompose into food for other living things. Bacteria and fungi feed on the organic waste of both the tree and the animals that eat its fruit, depositing nutrients in the soil that the tree can take up and convert into growth. One organism’s waste becomes food for another. Nutrients flow perpetually in regenerative, cradle to cradle cycles of birth, decay and rebirth. Waste equals food. Our cities are currently designed for linear flow. Biological nutrients (such as food and wood) and technical nutrients (such as metals and plastics) enter at one end and are used, then discarded. After waste is sifted for valuable recyclables such as metals, paper and certain plastics, it flows out the other end, headed for landfills or incinerators. The process is “take, make, waste.” But just as we have redesigned certain consumer products to be disassembled, recycled or reused, we can design cities in a similar, circular fashion: take, make, retake, remake, restore. In the circular city, wastes become resources. Consider sewage. In a linear city, wastewater-treatment plants process food residues and human waste—including the valuable minerals they contain such as phosphate—and release the effluent into rivers as pollution. Farmers then buy more phosphate from Morocco or other distant lands to make new fertilizer to grow more food in soils that have lost those minerals. In the circular city, sewage- treatment plants become fertilizer factories. The carbon, phosphate and nitrogen flowing out of the facility are seen as potential assets for soil, not as liabilities for the nearest river. Circular cities mine the wastewater for phosphates and turn it into fertilizer for parks and vegetable gardens on city rooftops and for farms and forests surrounding the city. This process eliminates the need to buy more phosphate from faraway sources and transport it to the U.S. It also avoids the energy and carbon emissions involved in mining and transport. Ostara Nutrient Recovery Technologies in Vancouver is one of several companies pioneering the collection of the phosphate mineral struvite for fertilizer from sewage sludge. Eliminating the concept of waste extends to all systems, so circular cities design incoming materials for “next use” instead of “end of life.” For example, new technologies allow cell-phone circuit boards to be profitably processed in a clean facility, where all the rare earth minerals and precious metals are recovered for reuse in new electronic products. A second key principle of nature, and what we might call positive cities, is that everything is powered by the sun—and sometimes, like the Iceland city of Reykjavík, by geothermal power. Trees and plants manufacture food from sunlight—an elegant, effective system that uses the earth’s only perpetual source of energy income. Buildings can tap into solar income by directly converting the sun to energy, and by passively collecting the solar radiation for heat and natural lighting. Winds—thermal flows fueled by sunlight—can also be harnessed. Together solar, wind and geothermal energy can generate enough power cost-effectively to meet the needs of entire cities and regions, even nations. Cities such as San Francisco are already making significant progress toward meeting their commitments to run 100 percent on renewable energy in the next 15 years. The third key principle—diversity—is found in all healthy ecosystems. Each organism has a unique response to its surroundings that works in concert with other organisms to sustain the system. Each organism fits in its place, and in each system the most fitting thrive. Urban designers aiming for what fits attend carefully to local ecologies. They assess the geology, hydrology, vegetation and climate. They incorporate natural and cultural history. By combining this rich “essay of clues,” designers discover appropriate patterns for the development of the landscape. By doing so, they create possibilities for positive growth that supports life. Ultimately, what we want is a city designed to allow people to live and work in the same neighborhood. If residents can decompose cell phones at a clean factory that fits within a city’s ecosystem, there is no need to relegate the factory to special zones of bad behavior at the outskirts of town. A positive city eliminates the need for zoning driven by concern about unsafe or unhealthy activities. Factories can be in the middle of clean residential neighborhoods, providing jobs so people can live within walking or biking distance. That opportunity, in turn, greatly reduces the need for commuting and transportation—a huge waste of resources and of people’s time. And if fresh, healthy food is grown on rooftops across the city, as Method Products’ new South Side Soapbox factory in Chicago is doing, not only can local organic waste be a resource for food growing systems, but people working at the rooftop farms can live locally as well. Imagine everything we make as a gesture that supports life, inspires delight and finds harmony with nature. Buildings operate like trees; they sequester carbon, make oxygen, distill water, provide habitat for thousands of species, and convert solar income into all the thermal and electrical energy they need—and sell excess power to the neighbors. Buildings with on-site wetlands and botanical gardens recover nutrients from wastewater and clean what remains for on-site kitchens and bathrooms. Fresh air, flowering plants and daylight are everywhere. Buildings and communities function as life-support systems. With this vision in mind, we can imagine food and materials produced in the surrounding countryside, created with tools and technology made in the city. The city returns waste as a raw material that replenishes the system, putting the “re” back into resources. Everything moves in regenerative cycles, from city to country, country to city, in natural and cultural networks that circulate biological and technical nutrition—the hardware and software of the 21st century. The metabolism of a living, positive city allows human settlements and the natural world to flourish together. If we are to make our cities truly sustaining and beneficial for all, we need to take this as a literal, strategic truth that informs all our designs. It is compelling to lay out principles for a utopian future. But can existing cities actually put them into practice today? Some recent industrial facilities are demonstrating how. The renovation and expansion of the Ford Rouge Center in Dearborn, Mich., transformed the massive, historic car and truck manufacturing complex into a model of industrial sustainability. The master plan incorporated a 10-acre green roof—the heart of a system of wetland gardens, porous paving, hedgerows and bioswales. The project turned a 100-year-old industrial brownfield site into a thriving stormwater ecosystem that captures, cleanses and slowly releases water to the adjacent Rouge River in ways that support watershed health. Native killdeer returned to nest a week after construction was completed. Another model is Sustainability Base, NASA’s new center for science and computing at its Ames Research Center in Moffett Field, Calif. The facility has the potential to provide all its heating, cooling and energy needs and even an energy surplus, from solar and geothermal sources and a fuel cell with advanced energy-management controls. Wastewater is treated on-site. The award-winning Park 20|20 development in Hoofddorp, the Netherlands, is another model. It is a diverse set of buildings and open spaces now being completed across 28 acres. People can access the park easily by air, rail, bus and bicycle. Green zones, plazas, public gardens and canal boardwalks provide a connection to the larger community. Each building’s size, structure and orientation are optimized to capture the sun’s energy and light. Buildings across the park integrate energy, water and waste-management systems, acting as a single organism. Can we expand these successes to entire cities? Inspiration comes from some intriguing places. One of them is Curitiba, Brazil. Curitiba began transforming in the 1970s, under legendary architect and urban planner Jaime Lerner, who was mayor three different times from the 1970s to the 1990s. During his first term Lerner realized that the poor town of several hundred thousand inhabitants needed better public transportation. Because a subway or heavy rail system would cost far too much, he instead asked Volvo to make 270 Swedish articulated buses, done within the city, which gave residents jobs. The city hired locals to build aboveground, streetside bus shelters, or tubos, from which people could travel anywhere for a flat fare. Instead of riders paying with a token as they boarded a bus, a slow process, Lerner had them prepay when entering the tubos platform, so when the bus arrived they could get on quickly, reducing loading time and making the entire system efficient. As a result of Curitiba’s rapid population growth, garbage was piling up in narrow alleyways where trucks could not retrieve it. Lerner created a program to instruct children how to separate trash, then sent them home to teach their families. In exchange for the sorted garbage, people were paid in bus tokens or fresh food; Lerner paid them in a currency for mobility. Suddenly, everyone was using mass transit. Today 85 percent of Curitiba citizens use the bus, and 90 percent participate in recycling. Curitiba recycles 70 percent of its refuse—one of the highest rates in the world. This innovative thinking went on and on. Instead of building a big central library downtown, the city built a network of 50 small “Lighthouses of Knowledge” throughout the neighborhoods so that every child was within walking distance of a library. Local builders, of course, constructed the brightly colored buildings. The libraries work with municipal schools and offer thousands of books and free Internet for citizens ages three to 80. These and other steps transformed the city to a live-work design. Now imagine if Manhattan had this same kind of vision—with local food growing on the rooftops of hundreds of schools and hospitals, providing nutrition as well as local jobs. Kids could use their optical sensors known as eyeballs to sort trash, pull out the plastics, bring them to recycling centers so they do not end up in the ocean, and get paid in toys. Clean factories would then reformulate the plastics into monomers that can be used again. Everything is powered by the sun, and materials flow in continuous cycles of biological and technical nutrition. What we are after, for all people, is something I would call the “good life”—a life that is safe, dignified and creative. Positive cities are the places where that can happen. If they are designed and run on this principle, everything gets better. We have to insist on the rights of humanity and nature to coexist, to bring together the city and its surrounding countryside. Cities are designed, but they are also organisms. As the late French anthropologist Claude Lévi-Strauss pointed out years ago, cities are “something lived and something dreamed.” As makers of living places, we cannot help projecting ourselves onto the landscape. But as we dream of our ideal cities, as we conjure the human weft on the geologic warp of the land, we can begin to see more clearly the true character of the place we inhabit, its spirit. Then, as we shape the nature of our cities, we will be making places that celebrate both human creativity and a rich, harmonious relationship with the living earth. We will be forging a new geography of hope. This article first appeared in Scientific American July 2017.